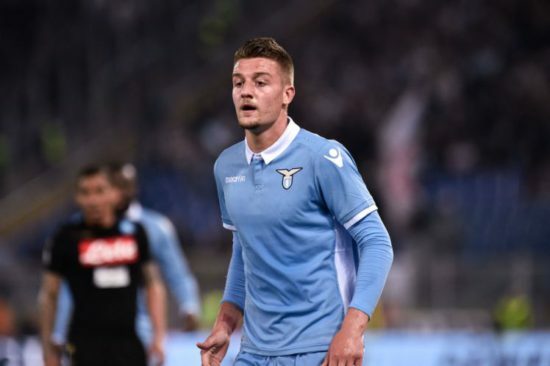 Chelsea reportedly makes a mouth-watering double offer of €115million plus Charly Musunda in an attempt to beat Manchester United to the signing of Lazio’s midfielder Sergej Milinkovic-Savic. Report from Calciomercato speculates that the Blues might land the deal despite the uncertainty about the future of the player, Chelsea is putting much effort to bring Milinkovic-Savic to West London as they appear to be the most preferred. Report also claim that the Serbian international seem to be pleased with Chelsea by making it clear that if he intends to move to the English League, West London would be his preferred destination. The 23-year old midfielder of recent has been on the top list of many big clubs who intended to sign him, Juventus and Real Madrid have been speculated to be interested in the player while Manchester United and Chelsea are in the recent race to get the signature of the highly rated player. The Serbian international has impressed the fans of Serie A with his unique style of play as an attacking midfielder with many goals to his name, he has been compared with other stars like Paul Pogba after the midfielder scored twelve times in his last season performance and he is said to be of high value to the Italian club. However, English giant Manchester United might not be able to make a counter proposal to beat Chelsea’s offer losing the chance to move Malinkovic-Savic to Old Trafford.